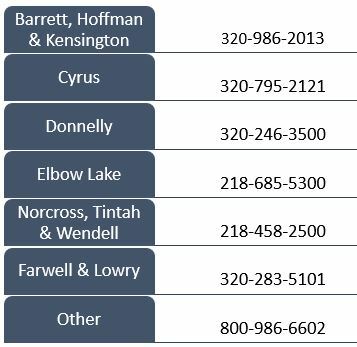 We provide phone service in west-central Minnesota to the areas of Barrett, Cyrus, Donnelly, Elbow Lake, Hoffman, Kensington, Lowry, Norcross, Tintah and Wendell. Subsidized discounts are available to customers meeting certain low-income criteria. Information concerning these plans is available at Runestone Telecom Association at 320-986-2013.